Ohiwa Beach Holiday Park is only a short drive to Whakatane, Ohope and Opotiki. The area is known for its relaxed, balanced lifestyle and although it’s not a bustling metropolis, it rivals our bigger cities when it comes to its diverse and delicious eateries. From vibrant berries to famous oysters, the region has something for everyone. With so many great eateries to choose from, you can try something new or stick with the tried and true. We are a coastal region abundant in fresh fish and shellfish. Our landscape also offers the perfect growing conditions for fresh fruit and vegetables and many of the region’s eateries pride themselves in using local, seasonal produce. Food is an important part of a great holiday and whilst we have excellent cooking facilities on-site, we encourage our guests to taste some of the great food produced in the Eastern Bay of Plenty. Camp meals no longer have to consist of cans of beans and cold sizzlers. Staying at Ohiwa Beach Holiday Park could be your most delicious camp holiday yet. Great cafes, great coffee – what more could you want? If you’re a coffee aficionado, you’re in for a treat. Cafes and coffee spots in our area are well trained in the fine art of making a great coffee. To go with your decadent dose of caffeine, these cafes offer exceptional food as well. Moxi Café is one of Ohope’s newer cafés but it didn’t take long to become one of the favourites. With great coffee and extensive menu, Moxi Café is regularly visited by Ohope locals and those passing through the small town. Get the true Moxi experience with a fresh meal and a cold glass of craft beer. Two Fish Café is located in Opotiki, only 15 minutes from Ohiwa. Two Fish Café has earnt a fantastic reputation from travellers stopping in on their way through the region. Fresh food, well-crafted coffee and staff who are passionate about delivering the best service at all times, Two Fish Café ticks all the boxes. Here you can grab a quick bite from the cabinet or take your time and order from the menu. Takeaway is also an option if you’d prefer to bring your tasty meal back to the Holiday Park. Once you sit down at the Port Ohope General Store and Café, you won’t want to leave. It boasts a stay-as-long-as-you-like atmosphere that may see you ordering coffee after coffee to really soak up the vibe. Sit outside in the sunshine, look out onto the ocean and enjoy zero time constraints. The team at Port Ohope General Store and Café source local ingredients to bring you the best the area has to offer. The Eastern Bay of Plenty is best known as one of the more relaxed parts of New Zealand. Even so, the restaurants in the area know how to deliver excellent, high-quality food. As a long-standing member of the Ohope community, the Fisherman’s Wharf Café is a strong favourite for residents. Overlooking the Ohiwa Harbour, watching the sun go down from the Fisherman’s Wharf Café is an experience in itself. There’s nothing quite like enjoying a beautiful meal amidst Ohiwa Harbour’s natural tranquillity. If you’re not in the mood for the restaurant vibe, grab some fish and chips to eat on the banks of the harbour. Whakatane is a little further from Ohiwa Beach Holiday Park but by all accounts, it’s worth the extra drive to visit Roquette Restaurant and Bar. Using the finest ingredients, the chefs at Roquette have designed a menu of a very high standard. Roquette is a busy place, which says a lot about the quality of its food. The contemporary setting is the perfect place for an intimate dinner with friends or family and it is also a licenced bar if you’d like to enjoy a drink or two. Cadera has only been open since 2016 but has quickly become the go-to restaurant for fresh food and great bar service. If you love Mexican food with a spicy kick, you’ll love Cadera (but don’t worry, there’s plenty here for those who like their food mild). Cadera has a great ambience for socialising and a perfect location for larger groups. Cadera is your one-stop-shop for all things tapas, tacos and margaritas. The Eastern Bay of Plenty has several hot spots with food and beverages unique to the area. If you want the best of the best, check out these places. Mata Brewery began with a small home brewing kit in 2004 and flourished into a fully-fledged brewery and restaurant. If you’re heading our way for a holiday, we highly recommend a visit to Mata Brewery. Craft beer is what they do best and they are constantly innovating new ranges as well as offering seasonal selections. Be sure to try the food while you’re there as they also have a great menu. There’s nothing quite like the juicy, plump berries of summer time. With the weather being so mild in our area, it provides excellent growing conditions for some of the country’s most delicious berries. Julian’s Berry Farm has the biggest berry selection in the Eastern Bay of Plenty with blueberries, strawberries, boysenberries, raspberries and many more. You can pick your own (and have a cheeky taste on the way) or buy them ready-picked. But Julian’s Berry Farm is so much more than just berries! Have a round of mini golf, visit the animal farm, sit down for lunch at the café or get your hands on one of their famous Julian’s berry frozen yoghurts! For decades visitors have come from far and wide to taste the juicy oysters from Ohiwa Oyster Farm. Oyster-lovers will be in their element when they see what’s on offer here. 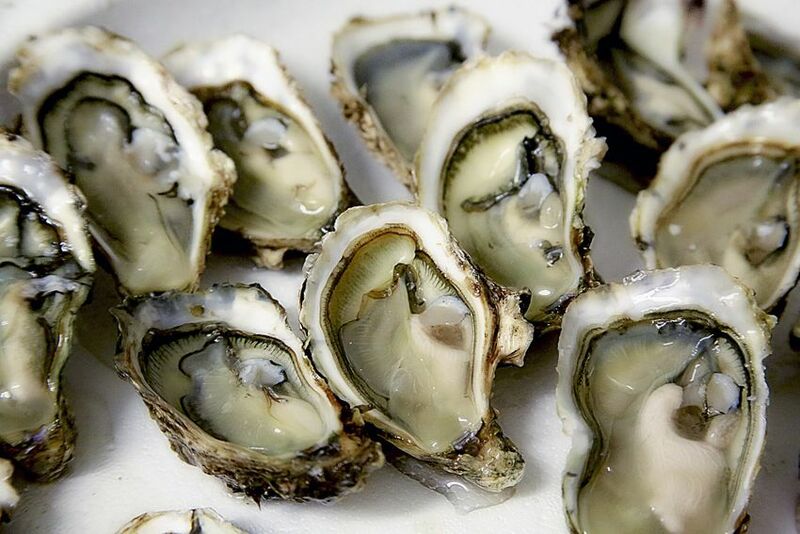 Producing oysters since 1968, Ohiwa Oyster Farm is one of the most authentic Kiwi takeaway stops in New Zealand. Located on the shores of Ohiwa Harbour with views of Ohakana Island, you couldn’t find a better spot to sit and enjoy their oysters. Our region has become well-known for its great food and many who visit the area look forward to trying something new. With summer around the corner, produce is changing with the seasons and exciting things are happening at our local restaurants and cafes. With all the amazing eateries in the area, your summer holiday at Ohiwa Beach Holiday Park could be anything you want it to be. Get the authentic Kiwi experience with fresh fish and takeaways, or venture to a café or restaurant and take in the atmosphere. You will be spoiled for choice. It’s time to start planning your summer holiday. Check out our range of accommodation and book your space today.